Diversity is a hot topic for many companies. Companies are starting to realize that having a homogenous team is bad for innovation. That’s why companies are eager to implement recruiting methods that will attract diverse applicants. The work doesn’t end after you’ve managed to put together a diverse team, however. Your company won’t reap the benefits if there are no systems in place that allow everyone at the company to be heard and to have equal opportunity to give input and ideas. You can’t reap the benefits of having a diverse team if you can’t create an environment in which everyone will be heard. Creating an inclusive environment is not something many companies know how to do. You might have an extremely diverse team, but its output could still only reflect the ideas of a small group of individuals who, for whatever reason, dominate within that team. Facilitation methods are an excellent way to get the most out of every (type of) person in your team. The thing is, everyone is different (duh..) and everyone has different needs that allow them to do their best work. The typical example used, is the difference between extraverts and introverts. Where extraverts are creatively stimulated in group brainstorms, introverts will do better with individual ideation. Workshops can be designed in ways that work for everyone and allow everyone to get their creativity flowing. This requires a good understanding of how people work, as well as the ability to recognize when team members are disengaging or being shut down by others. As a facilitator, you have the power to flip the script and amplify voices that are not usually heard. If this is done well then facilitation can even help to counteract inequalities. Whether those are due to internal hierarchies that exist in a company or due to the systematic inequalities that our society suffers from like racism and sexism. As a facilitator, you have the power to flip the script and amplify voices that are not usually heard. This isn’t easy because it requires recognizing your own biases. Luckily this is a skill you can develop. It‘s about having a birds-eye view of what’s happening in a group and being able to improvise when you see that power dynamics are negatively influencing a team. During the facilitation course, I found it incredibly useful to have an expert watch me facilitate and give feedback about things I was missing in the group. Sometimes it takes an external person that is not participating in the workshop to see what your biases are (who are you favoring, who are you allowing to dominate the group, who is not involved, and what can you do to counteract this). Presentations have always been my go to when I wanted to pitch something or share my knowledge on a topic to a group of people. I now realize how futile (and frankly, arrogant) it was of me to do a one-way broadcast of my brainwaves and expect people to get on board with my ideas…and then complain that people hadn’t paid attention when it became clear that my ideas hadn’t stuck. Never again! Don’t expect people to learn from a one-way broadcast. During the facilitation course, it became clear to me that this is not how people learn. Ever wondered why you weren’t able to actually change your life after watching that “life changing” TED talk? The truth is that lecturing only results in 5% of information to stick. My biggest takeaway from the facilitation course is that learning is a process. This sounds so obvious, but it’s something few people actually take with them in their work. To be exact, learning is a process that has three phases that form an arch: setting, holding, and landing. I won’t go into detail on what these learning arches* entail because you probably won’t remember (since reading only results in 10% of information to stick 😉). But take my word for it, the concept of learning arches is applicable to everything and anything that has to do with human behavior. Whether you want to get your customer to change their behavior (onboarding processes, ugh) or even if you are raising a child, or damn, if you are trying to to make structural societal change, this concept will help you! Just to give an idea of what learning arches entail: this blogpost is the beginning of your learning arch to learning about learning arches (inception?). The arch will land at the end of the facilitation course if you decide to take it. 3. Sometimes you have to let things go wrong. No, this is not a call for anarchy, but it is a call to stop solving problems all by yourself when they should be solved by your team, collectively. Have you ever worked in a team that had an unclear division of tasks? Have you ever been the person that resentfully picks up all the forgotten tasks at the detriment of your own time and sleep? If this sounds like you, then you’ve probably been praised for being a hard worker and for picking up the slack. You’ve probably also realized that this behavior is not sustainable over a long period of time (did someone say burnout?). It’s time to stop being the sole problem solver, for the sake of your own health, but also for the good of the team. This behavior is standing in the way of your team becoming high performing, efficient and supportive of one another. But then what do you do when things are going wrong and your team has failed to recognize it. Let it go wrong. Let things escalate. Allow the team to fail. Does this sound scary? It is! But it’s so worth it because it will allow every single team member to realize something has to change. Only then will your team actually sit down and figure out how to function better together. Creative problem solving will come from the whole team and not just from one person. Allow your team to fail. It’s for the better. What does this have to do with facilitation, you ask? Well, facilitation allows you to let things go wrong in a controlled environment. During the facilitation course, I learned multiple ways to demonstrate team problems that allow the team to recognize them on their own. Being told: “this is what you’re doing wrong” doesn’t work. Recognition of a problem from personal experience is what will get a team to solve the problem. People don’t learn unless they want to. This has honestly been mind-blowing for me to understand and it will forever change the way I address problems in my team. These are not necessarily things you’de expect to learn during a facilitation course, but I’m certainly not complaining. These lessons have come on top of the concrete “how to” of facilitation that I was initially hoping for when deciding to take the course. The additional life lessons are quite the bonus. If you’re interested in taking the Mischief Makers facilitation course, the next one begins on May 25th. I would recommend. *learning arches are a concept by Kaos Pilots. 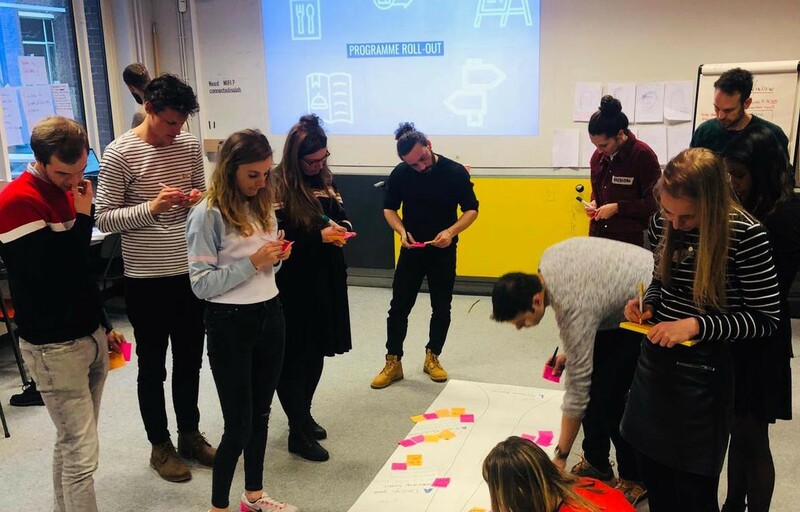 The Mischief Makers facilitation course curates and introduces only the very best methodologies like learning arches, Hyper Island’s toolbox, an endless supply of theatre and improv training tools, psychology models and of course Mischief’s own tools and methods.